Any lifelong fan of superheroes has at one point wanted to be one—to suddenly have superpowers, to fight evil, to do what ordinary humans can’t do. It’s a fantasy that’s directly entertained by “Shazam!”, as director David F. Sandberg puts the premise of “Big” into the DC Cinematic Universe as it continues to expand and lighten up. But while “Shazam!” is goofier (and darker) than it may look, you'll wish its superhero came with a little more spark. About that third act—part of the intrigue in “Shazam!” is in watching a young person who doesn’t know much better learn to use their powers for good and not just yuk-yuks, like when Shazam does tricks for tips shooting lightning out of his fingers. When the movie confirms how it will make a sequel about this same storyline for new characters, "Shazam!" takes its full cheesy form, as much as Sandberg's camera swoops around a Christmas carnival-turned- battleground set piece like it's been attached to the scrambler ride. “Shazam!” slows down when it should be ramping up, its action proving to be less inspired than the zippy dialogue between Billy’s makeshift family, or moments in which Dr. Sivana goes all-in on being evil. The big showdown between Dr. Sivana and Shazam especially is as mindless as when a kid nearby is shown smashing Batman and Superman action figures together, one of that final battle’s visual moments of comic relief. 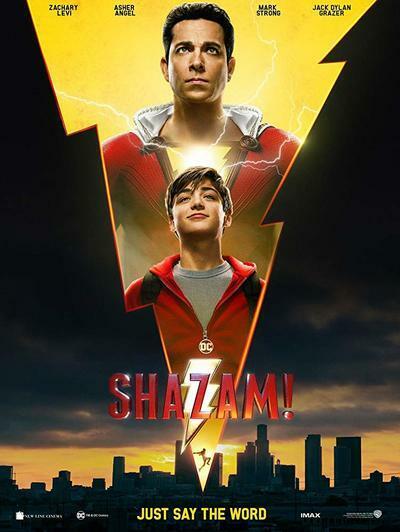 Still, there’s a fair share of fun to be had with “Shazam!” as a comedy about superhero growing pains from a comic book company also figuring itself out cinematically. But while it’s a nice step away from the blunt machismo of earlier DC fare, it’s a noticeable downgrade in imagination from James Wan’s “Aquaman" and that film’s $200 million-version of daydreaming while playing with your toys in a swimming pool. Compared to any of its super peers, “Shazam!” is more straight-forward with its purpose and significance: it’s the blockbuster version of plopping down in front of a Saturday morning cartoon, watching an archetypal caped crusader save the day. All the while you slurp your sugary cereal, an act of killing time before the next major superhero story comes to theaters.